What trees should you plant in Louisville, KY? 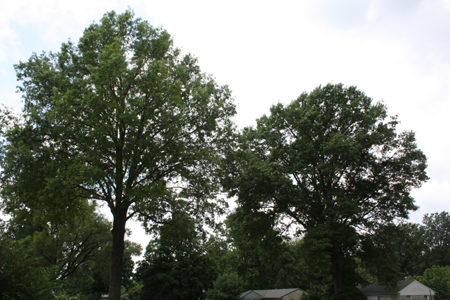 When is the best time to plant an oak tree in Kentucky? As the old saying goes. The best time to plant an oak tree, was 20 years ago. The second best time is now. Which although, true, is also false :) The best SEASON to plant a tree is in the fall after the leaves have dropped and the trees have gone dormant, or very early spring before budding activity has begun. I live in an older neighborhood where the homes were built in the 50's and early 60's. The trees in my neighborhood are nothing short of majestic. Huge towering oak trees that keep the squirrels busy all day long. In my back yard I have a Southern Magnolia tree and a Black Walnut tree. Both of which drop stuff into the yard nearly year round. I think one of those trees would have been fine, but having both of them can be a bit of a pain. Even though they drop nuts, leaves and blooms all over the place, they still are very pretty and offer a great deal of shade to my backyard. In my front yard, I'm not as lucky. The ice storm of 2009 destroyed every living plant and tree in my front yard. This was prior to my ownership of the home, but I was able to see that two trees had previously been planted in the front yard. For some reason or another in the 90's flowering pear trees, specifically the Bradford Pear became very popular as an ornamental tree. The great thing about them is they grow very quickly, the negative is they grow very dense and have weak branches. Unfortunately they usually are destroyed by wind and thunderstorms as they mature. Which brings us to our next question... We know that we should be planting trees NOW since none of us know how to build a flux capacitor, but what kind of trees? Thankfully Mark White, the City Arborist has provided this list of trees that make sense for planting in our climate and weather zone. Since it can take a while to research the best options for you, we are sharing this info today so you'll be ready for the fall. Do you have a favorite tree on this list? Sound off in the comments below!